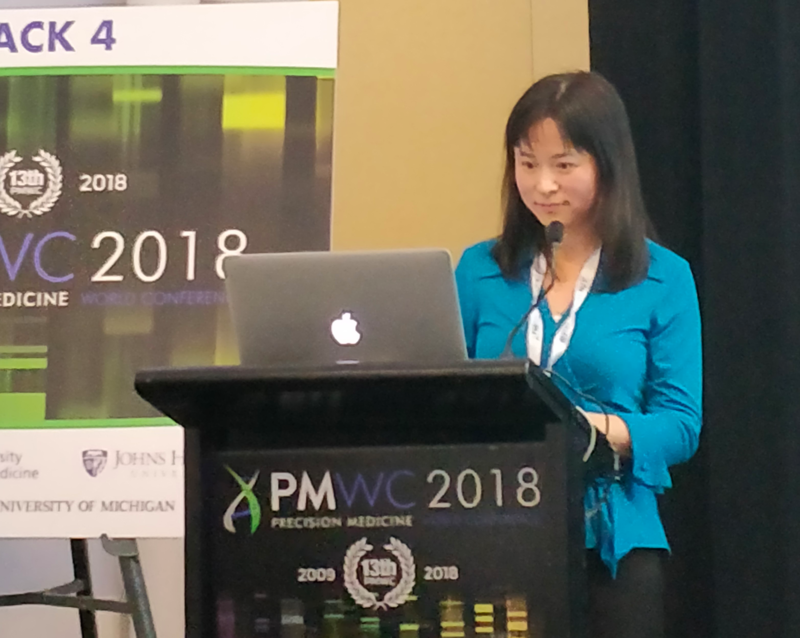 The Precision Medicine World Conference (PMWC) of 2018 was held in Silicon Valley from January 22 to 24 in the United States. At the "liquid biopsy" forum, the invited speakers were well-known companies in the field of liquid biopsy, such as Thermo Fisher, Guardant Health, Bio-Rad, GRAIL,Genomic etc. As the only Chinese company invited to participate, Dr. Weng Li,senior vice president, gave a keynote speech entitled "The Application of ctDNA Detection in Customized Cancer Management" to show the latest achievements in liquid biopsy. Precision Medicine Global Forum (PMWC), as an outstanding forum focusing on different fields and directions of precision medicine, has been approved by authoritative entities and experts in medical and biotechnology fields, and has attracted many researchers from various interests. The actual cases displayed will help to link up the latest achievements of multi-disciplines, promote cross-border cooperation in the field of precision medicine, and further promote the development of clinical application of precision medicine. Excellent performance of Firefly™ technology has been fully verified. The unique "concatemer Sequencing for NGS Error Correction "Firefly™ technology of AccuraGen has obtained many patents at home and abroad. This technology aims at the "very low mutation frequency (median mutation frequency is only 0.5%)" and "second-generation sequencing technology high background noise (mutation rate higher than 1%)" in the field of ctDNA detection. These two core pain points are effectively solved by innovative improvements in database building strategy and biometric analysis. At present, the technology and its industrialized product, Accu-Kit™ ctDNA-NGS kit, have been verified by more than 2000 samples from more than 20 large hospitals in Beijing and Shanghai, which fully prove its excellent performance. The average detection rate was 100% when the sample size was 35ng and the AF value (Allele Frequency) was 0.1%. After many experiments, the specificity of Firefly™ inclusion test was 99.96%. In non-small cell lung cancer (NSCLC) patients, the coincidence rate of Firefly™ ctDNA-NGS with ARMS was 97% and that of ddPCR was 97.4%. None of the 50 healthy subjects tested for EGFR/KRAS/BRAF gene (using the LC-01 kit) was false positive. Deepen product research and development in MRD and early-screening. In view of the excellent performance of Firefly™ technology, AccuraGen will further expand the market layout,deepen the development and production of kits, meet the needs of tumor mutation gene detection in the guidelines effectively , to provide timely, convenient and accurate solutions, and promote the healthy development of the ctDNA detection industry within the framework of national policies and regulations. Minimal residual disease (MRD) detection and early tumor screening are still the major problem. Professor Zhiqian Hu, doctor of General Surgery of Changzheng Hospital, used Firefly™ technology to detect the ctDNA in the plasma of hundreds of patients with colorectal cancer before and after operation. The detection rate of ctDNA mutation in preoperative blood and the high coincidence between the atlas and the reported TCGA data were proved,which verfied the accuracy and authenticity of Firefly™ technology and its feasibility in detecting colorectal cancer MRD. In the field of early cancer screening, AccuraGen has introduced the new Accu-Scan Panel with more than 2,000 genes, focusing on seven cancers with the highest morbidity and mortality in China, which can be used to detect early tumor burden. Three advantage resources lead the development of precision medicine. AccuraGen Holdings has experienced R&D teams in Silicon Valley,with central laboratories and kit production bases in Shanghai and Suzhou respectively. - Has the world's top scientific research team, scientific research personnel from Illumina, Affymetrix, Roche and other companies and Stanford, UCSF and other institutions. - Over the past four years, it has focused on scientific research in the field of liquid biopsy. - Core technology has many patents at home and abroad. - It has developed diversified product lines and realized industrialization in China. - Products for detection of minimal residual disease (MRD) are being fully developed. - It has a high standardGMP production workshop of 1700 square meters and a 600 square meter standard molecular quality laboratory. - CFDA medical device license is being declared. - Have third party medical laboratory with the approval of Health Planning Commission. - NGS laboratory has obtained the CAP accreditation. - Collaborate with more than 20 well-known hospitals and assist in building an in-hospital platform based on Firefly™technology, which will develop ctDNA-NGS testing platform independently in the future.